What – Dispersal correlates in marine invertebrates: The role of life history traits and oceanography. This study aims at understanding dispersal processes in marine species and their consequences for population genetics patterns. Marine species are unique because they show a wide range of dispersal abilities. Development mode is thought to be an important life history trait influencing dispersal potential across marine fish and invertebrate taxa. Larval dispersal is greatly influenced by oceanography, allowing marine organisms to travel very large distances. These two factors – larval dispersal ability and oceanography – determine the dispersal potential of an organism. Successful dispersal requires survival at the destination after a dispersal event, which is determined by habitat specificity of a species and the availability of suitable habitat.In this study, we propose to evaluate the role of each of these factors in influencing dispersal among marine species, with population genetics and phylogeography as a means of inference. For this purpose, we will use gastropods as study species in a comparative framework of study. 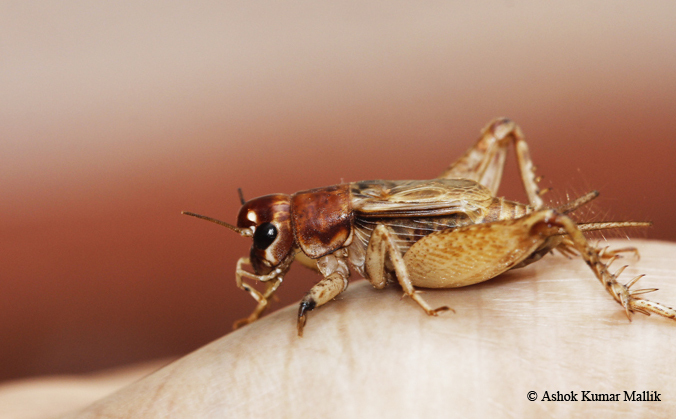 What – Predator-prey interactions in Tree crickets. Calling males are known to face risk from acoustically orienting predators. Evidence shows that females, that move around in the search for mates, might face as much if not more risk from opportunistic predators. 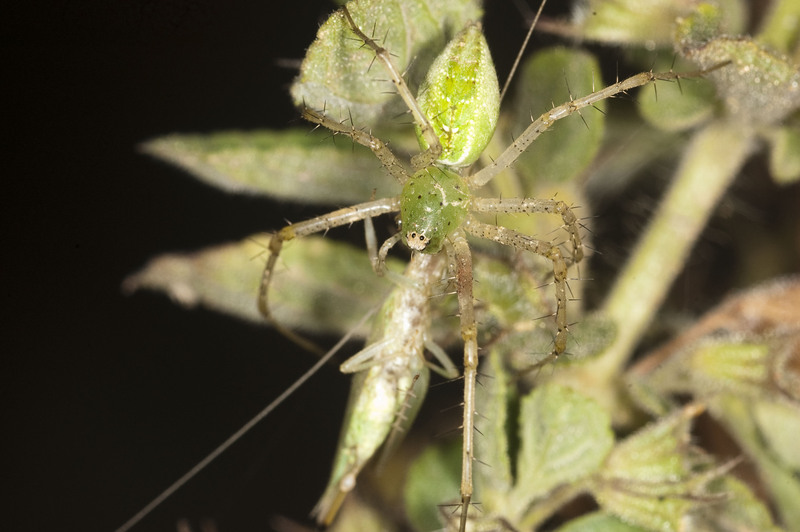 I aim to measure risk that these alternative mating strategies face in field, to look at costs of signalling in the tree cricket Oecanthus henryi. In India, the dry zone forms a huge part of the country. Yet very little is known about what drives the diversity and distribution of organisms in this region. While most of this region is scrubland, and scrubland modified by humans into agricultural land or villages and towns, it also consists of naturally fragmented rocky outcrops. I want to understand how this landscape has shaped the phylogeography of species in this region. 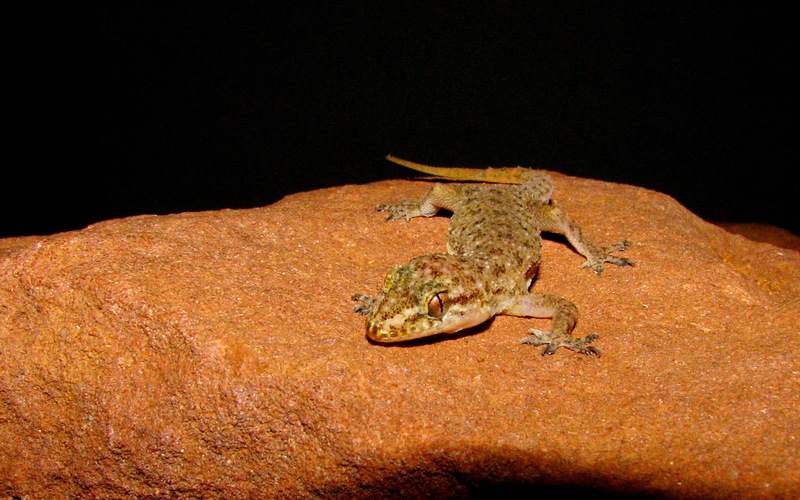 Hemidactylus geckos are an ideal system to study this as they are predominantly distributed in the dry zone and consist of species that are specific to rocky outcrops, scrubland and human habitation. I plan to choose three closely related species of Hemidactylus geckos that consist of a rupicolous (rock dwelling), terrestrial and human commensal gecko, and study them in a comparative phylogeographic framework. I also intend to study movement patterns in human commensal geckos. Human commensal organisms such as mice, geckos, and cockroaches, live in close proximity to humans. Studies on human commensals often show high rates of dispersal and lack of genetic structure, which is speculated to be due to human mediated movement. Therefore, I want to test if patterns of gene flow in human commensal gecko are correlated with human movement. The fig fig wasp system is an eighty million year old co-evolutionary relationship, wherein every fig species is associated with a specific pollinating fig wasp. Every fig–fig wasp mutualism is also usually associated with a set of obligately dependent , non-pollinating wasp species. 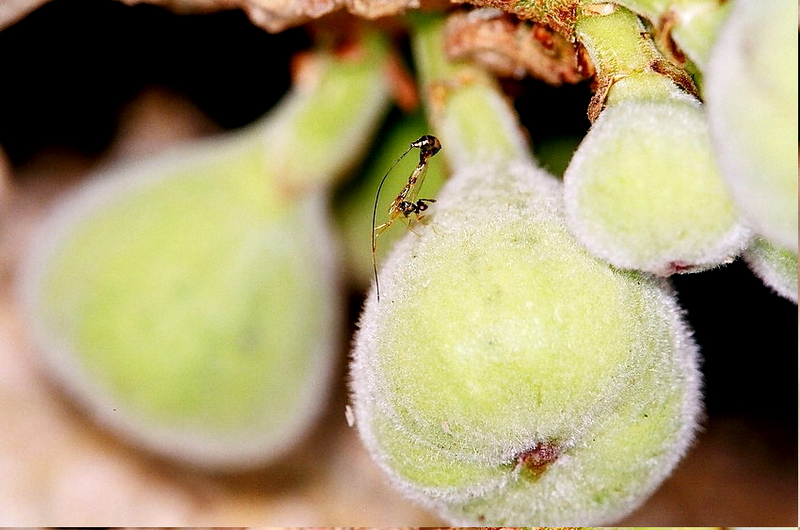 My study will explore the dispersal and host location abilities, and mechanisms that aid these processes of a pollinating fig wasp Ceratosolen fusciceps associated with it monoecious host plant Ficus racemosa. The first part of my study will address the comparative dispersal abilities of C. fusciceps with six other non-pollinating fig wasps in the F. racemosa system to understand the stability and co-existence of this community. I will also compare the dispersal abilities of C. fusciceps with a congeneric fig wasp, C. solomsi marchalli, of a sympatric dioecious F. hispida , which is expected to face a different ecological demand for host location. The second part of my study will address active odour- tracking in C. fusciceps using an experimental wind tunnel set-up, understanding the components of the signals emitted by F. racemosa to attract C. fusciceps, and how recent anthropogenic influences such as increased ozone levels and temperatures can affect both the signals emitted by the fig trees as well as the host location abilities of the pollinating fig wasp. Darwin was troubled by elaborate male traits observed in many species that are seemingly maladaptive for survival, the peacock’s tail being the most iconic of all. He wrote “The sight of a feather in a peacock’s tail, whenever I gaze at it, makes me sick” because it challenged his theory of evolution by natural selection for adaptive traits. The extreme length of the tail may render a peacock more vulnerable to predation and therefore maladaptive for survival. He hypothesized that peahens may find the tail attractive thus enhancing male mating success. This idea led to the formulation of the theory of sexual selection, wherein, traits that directly enhance mating success may be selected for, either through male-male competition for mates or through female-mate preference for elaborate male traits. Both male and female elephants in the proboscidean evolutionary radiation have had tusks and show extreme exaggeration in size and form. However, tusk in the Asian elephant (Elephas maximus) is sexually dimorphic as it is expressed only in the males, hinting at a possibility that opposing selection (sexual selection advantage to males and natural selection disadvantage to females) may have been the processes behind this pattern of tusk expression. 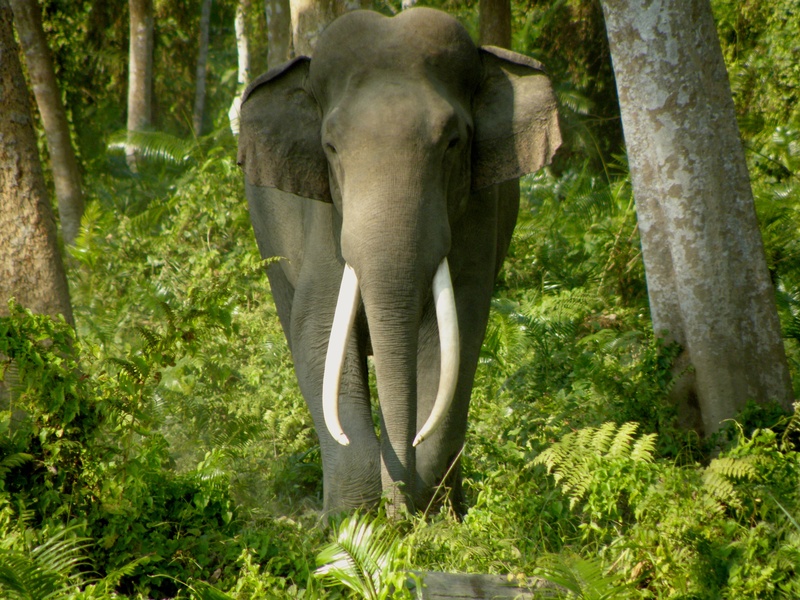 Intriguingly, tuskless males (male dimorphism with respect to tusk) also occur at fairly high frequencies in some Asian elephant populations. For my thesis I explored sexual selection and artificial selection (selective poaching of tusked males for ivory) on elephant tusks as possible mechanisms leading to the observed patterns of tusk dimorphism in the elephants. I used mathematical models of population genetics, population dynamics and field observations of the Asian elephant mating behaviour in Kaziranga National Park, Assam, to understand the evolution of tusk dimorphism in the elephants, with major focus on the mechanism of sexual selection. The interactions of plants and flower visitors may be compared to a pollination market where the plants use flowers as sensory billboards to attract their pollinators. These interactions are largely driven by visual and olfactory signals, which could be affected by external factors such as ambient light conditions and the backgrounds against which these signals are presented. Further, different flower visitors might also vary in their perception abilities of the same signals. These interactions of plants and their visitors in a community may be visualized as sensory networks which are based on the functional traits of the partners. Such sensory networks would help us to understand the community structure and the processes that govern it. The proposed study aims to investigate the sensory ecology of the plant–flower visitor community in the seasonal cloud forest of the Bhimashankar Wildlife Sanctuary. Dispersal is a central process in animal ecology, which affects a variety of other processes, like local adaptation, population and community dynamics, and genetic structure. With the high degree of habitat fragmentation today, dispersal ability determines the survival of a species in a particular landscape. Dispersal ability of a species is affected by 1) species-specific traits like morphology, ecology and life history traits; and 2) external environment related traits like habitat quality and patch area. Higher dispersal ability implies higher gene flow; the extent of gene flow determines the population genetic structure of a species in a given landscape. In my thesis, I use molecular tools (Amplified Fragment Length Polymorphisms), and butterflies as a model system, to answer questions regarding the relationship between the factors affecting dispersal ability and the resultant genetic structure. I start with an analysis of available literature to determine the most important species-specific traits that affect dispersal ability in butterflies. Wingspan emerged as a consistently significant predictor in this analysis. The second part of my thesis tests whether the relationship between wingspan and dispersal ability translates into a difference in population genetic structure. The third part investigates the effect of the spatial orientation of suitable habitat on gene flow. 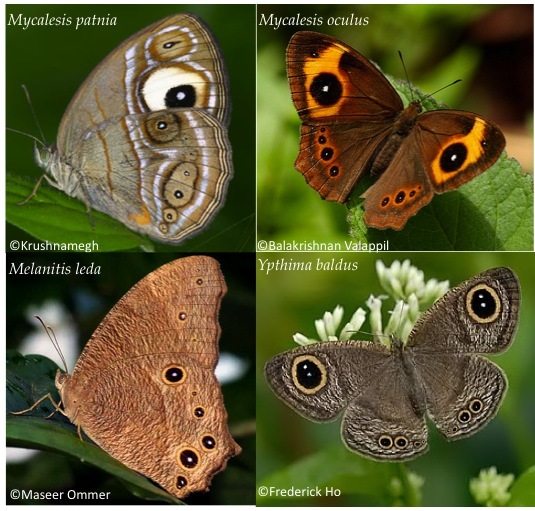 I have compared two species, one restricted to isolated, high elevation “sky islands” in the Western Ghats, and another found in the more continuous low and mid elevation areas. In plants, temporal patterns of reproduction can either be population-level or individual/within-tree level phenomena that could be synchronous (clustered in time) or asynchronous (staggered over time). The fig–fig wasp system is a pollination mutualism where pollinator wasps reproduce within the flower inflorescences (called syconia) that they pollinate. The system is also host to parasitic wasps that use syconia for reproduction but offer no pollination services. Temporal patterns of fig tree flowering affect reproduction site availability and so play a vital role in pollinator and parasitic wasp reproduction. Fig trees are known to display population-level reproductive asynchrony (to ensure availability of syconia for pollinator reproduction) and within-tree synchrony (to prevent self-pollination, wherein pollinators circulate pollen within a tree). Observations on several fig species indicated that within-tree asynchrony was more common in this system than it was thought to be. Its existence was postulated to have arisen as a tree-based trait simply as a consequence of resource availability patterns or for providing constant sources of syconia to maintain pollinator populations to benefit the mutualism. 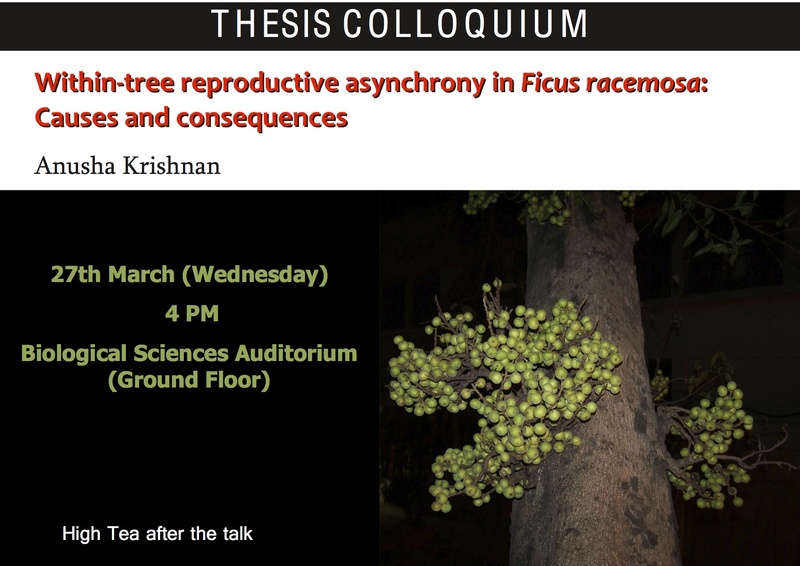 This study, conducted on Ficus racemosa— a fig exhibiting considerable within-tree asynchrony—shows that within-tree asynchrony is not a solely tree-based trait, but is also affected by pollinator and parasitic fig wasps which can shorten or lengthen syconium development times. Furthermore, this study also demonstrates that within-tree asynchrony benefits the mutualism by reducing parasitism pressure on pollinators, and that abiotic factors such as temperatures, RH and rainfall can modulate its effect on the tree and fig wasp fauna reproduction. Classification of organisms into different hierarchical levels was pioneered by Linnaeus. Phylogeny-based classification of organisms ranging from virus to plants has been in practice for a few decades, although with unequal effort in different biotas. Subfamily Gryllinae is a diverse group where based on classical taxonomy multiple classification hypotheses have been proposed however, none of them were ever validated. 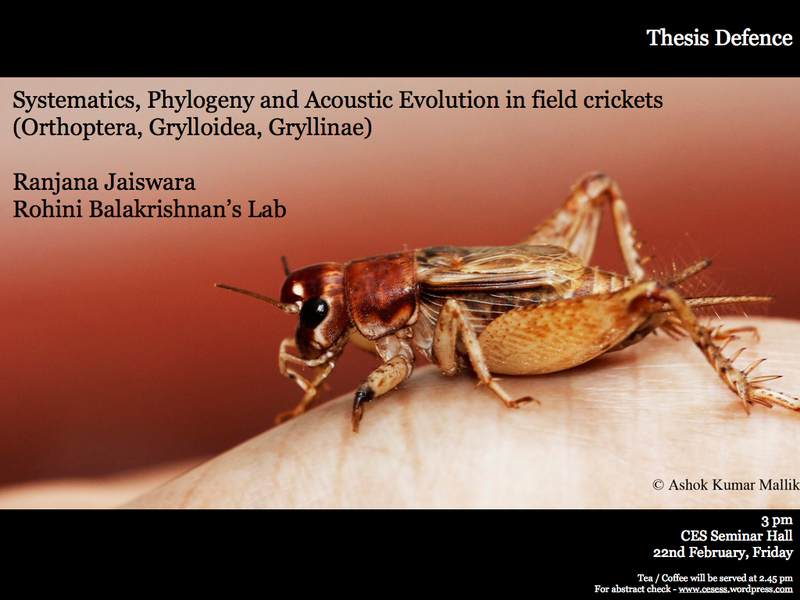 This thesis aims at providing an understanding of evolutionary relationship among field crickets and study evolution of different call patterns. Different datasets were also used in identification and species boundary delineation. Species that become naturalized in a new geographical range, subsequently multiply, spread, and persist (usually) to the detriment of resident communities, are defined as alien invasive species. This thesis is an attempt at understanding two aspects of invasion – spread and impacts of an invasive species. 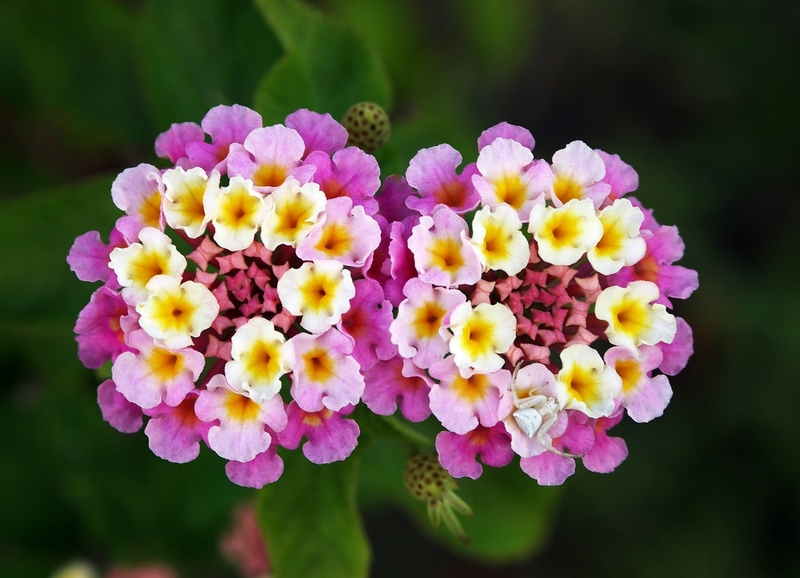 Lantana camara (Lantana), a plant of central and South American origin, is invading seasonally dry habitats across the world. While several ‘usual suspect’ biotic and abiotic factors were found to promote invasion by Lantana across time and space in Mudumalai , it’s impacts were found to be largely benign. Although Lantana continues to spread in this landscape, native woody species probably use existing adaptations to persist in spite of an alien invasion. Evolutionary radiations, clades that show exceptional diversification in species, are amongst the most striking outcomes in the history of life on Earth. My research revolves around an evolutionary radiation of frogs that we uncovered from the Western Ghats, a tropical mountain system in peninsular India. The broad goal of my thesis is to understand the causes and consequences of diversification, the primary process that drives evolutionary radiations. In the first part of my thesis, I address two major issues in biogeography, namely the ‘Linnean shortfall’ (the problem of undescribed lineages) and the ‘Wallacean shortfall’ (the lack of distribution data), and use an extensive sampling regime and a phylogenetic framework to delimit lineages. In the second part, I test the bush frog clade for characteristics of an evolutionary radiation and explore intra-cladal patterns in geographical distribution and ecological diversity. In the third part, I explore the role of emergence of new habitats as a causal factor in intra-clade differences in ecological and morphological diversification. In the final section, I determine the relative roles of ecology and geography in the diversification of bush frogs. 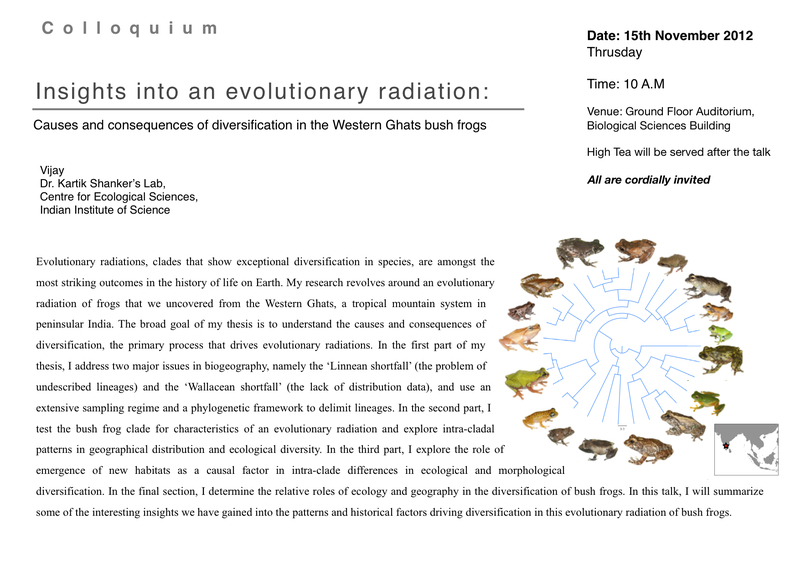 In this talk, I will summarize some of the interesting insights we have gained into the patterns and historical factors driving diversification in this evolutionary radiation of bush frogs. Several species of organisms are known to forage, breed and move in groups. Many of these species live in groups on a permanent basis, whereas there are others that form fleeting associations. Variation in grouping behaviour exists not only in size, permanance and the behaviour of groups but also the species composition. Less frequently observed and therefore less understood are heterospecific groups, where individuals of two or more species associate to form groups. Research regarding grouping behaviour, centered around mono-specific groups have provided insights into the benefits of group living. Grouping with heterospecifics can potentially lend benefits similar to grouping with conspecifics while lowering the disadvantages experienced due to competition. The study of heterospecific grouping behaviour allows us to explore two sets of ecological principles simultaneously; the patterns and benefits of grouping behaviour as well as the ecology of species interactions within a community. 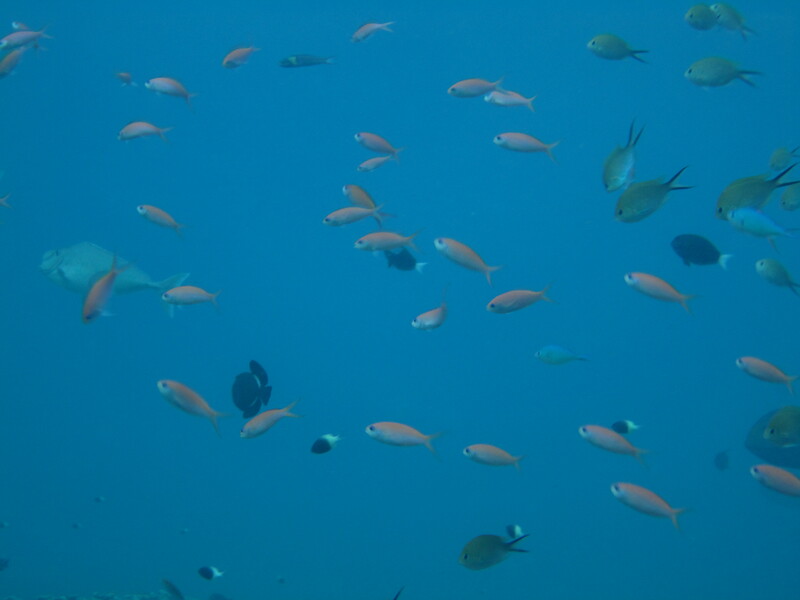 This project aims to understand the processes and mechanisms that lead to the formation of heterospecific foraging groups of fish, identify patterns in the distribution of such groups with respect to various resources and look for behavioral patterns in resource use. The study will be carried out in the Lakshadweep Islands, which is approximately 400 kms off the west coast of India in the Arabian Sea. The study will address three broad topics related to heterospecific foraging, primarily the adaptive significance of heterospecific grouping will be estimated and costs and benefits associated with grouping measured quantitatively. 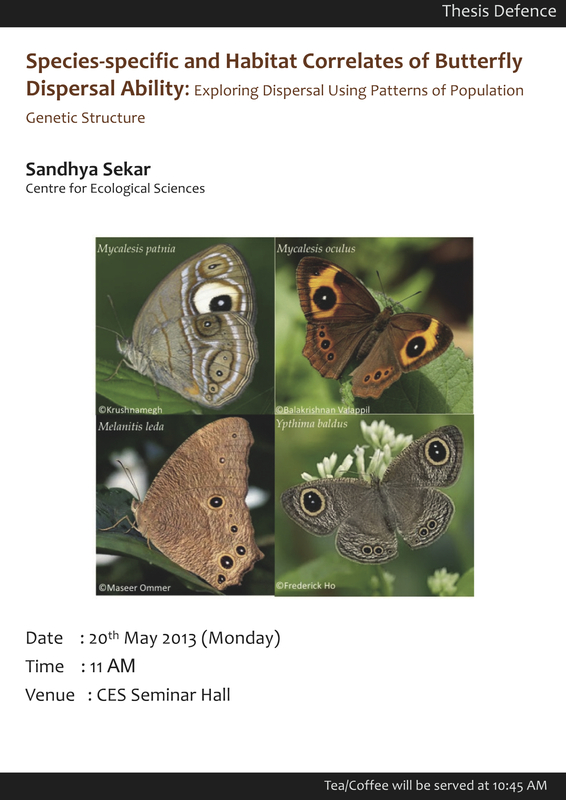 Patterns in the behaviour and characteristics of species that associate in heterospecific groups will be identified. The project will also study mechanisms that lead to the formation of groups. 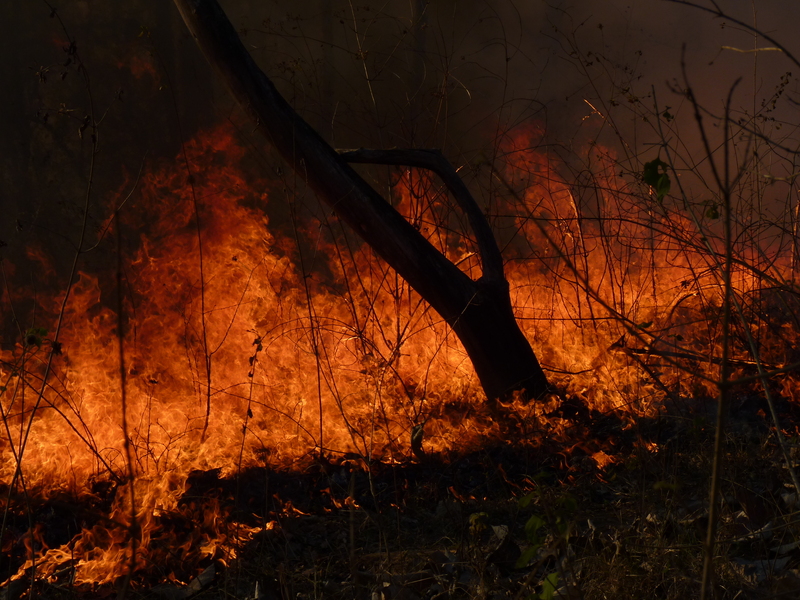 Fires in forests across the world can be considered as a “global herbivore”. It has the potential to shape forest structure and even the global distribution of biomes, along with other factors such as climate, soils and extensive grazing by large mammals. In turn, the frequency of occurrence and extent of fire is influenced by forest structure and species composition of flora, vegetative biomass (fuel) available for burning as well as climatic variables. This intricate and inseparable web of interactions between forest vegetation, climate, fauna and fire defines the study of fire ecology. The current dissertation addresses two aspects of this fire ecology web in a seasonally dry tropical forest. The first aspect examines the influence of the environment on fire extent and occurrence during the dry season. The second describes patterns of vegetation regeneration after fire. Reproductive strategies, which include life history traits and behavioural decisions regarding the timing of and investment in breeding events, can have important fitness consequences for an individual. One such reproductive decision involves choosing the habitat for laying eggs, also referred to as Oviposition Site Selection (OSS). In organisms such as frogs, butterflies and mosquitoes, OSS is an important reproductive decision because the quality of habitat chosen by the adult can strongly influence the reproductive value of offspring (and consequently the female’s fitness) as larvae are unable to move from their natal habitat until they attain maturity. I am interested in using mosquitoes to investigate the main ecological factors hypothesised to influence adult OSS. Specifically, I propose to (a) quantify the effects of two main ecological factors, namely larval predation and conspecific competition, on components of female fitness (larval growth and survival) and (b) examine adult female OSS behaviour in response to these ecological factors in field-based experiments as well as in controlled laboratory experiments. Finally, I am also interested in studying the consequences of different OSS strategies towards the dynamics of mosquito populations using a mathematical modeling approach. Ant-plant systems have been recognised as excellent models to investigate the evolution of mutualisms. In some ant-plant systems, the host plant or myrmecophyte provides special shelters (domatia) and/or food to its partner ants, which in return protect the host plant from herbivores. Humboldtia brunonis (Fabaceae) is a unique myrmecophyte, endemic to the Western Ghats, in which only some individuals bear domatia, although all individuals provide ant-food. Further, the domatia of H. brunonis are also occupied by numerous non-protective ants and invertebrates. The present dissertation investigates geographic variation in myrmecophytic traits and the strength of the protective mutualism in the H. brunonis system. 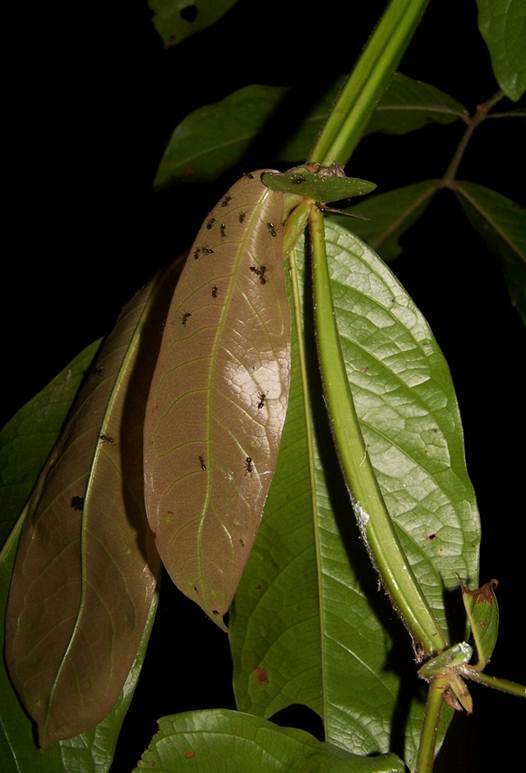 In the absence of protection by the ants occupying the domatia in most areas, the role of nutrient exchange between host plants and domatia occupants in the evolution and maintenance of myrmecophytism was investigated. Interactions between species that use similar resources have been examined largely in the context of competition. At the same time, numerous instances of positive interactions between species with similar ecologies have also been documented. Recent conceptual work has highlighted the need to incorporate such interactions, alongside competition, in ecological theory. 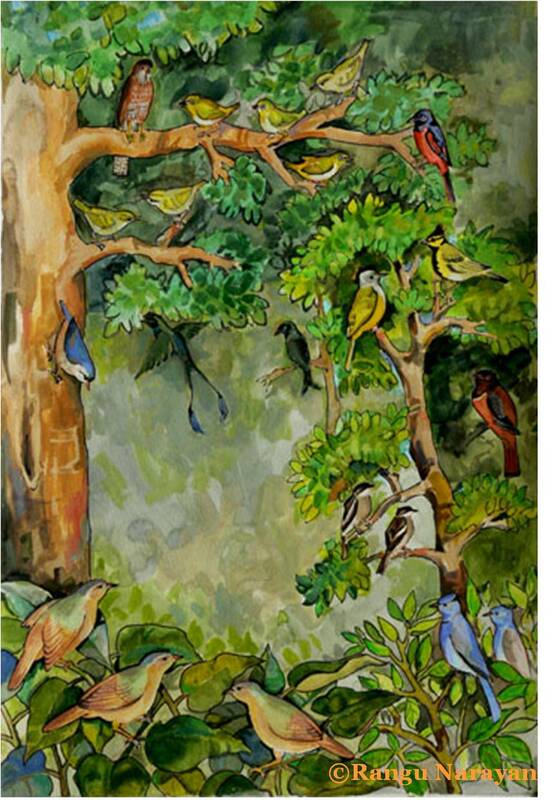 This dissertation focused on one such interaction, namely mixed-species foraging flocks of birds in terrestrial habitats. Using large-scale analyses of pre-existing data and behavioural studies in an evergreen forest in the Western Ghats, India I investigated two broad questions: 1.Why do such flocks form? 2. What are the consequences of flock formation on bird community organization? The specific approaches used to address these questions and the findings will be presented at the colloquium. Dominance behaviour is of special importance in social insects, as individuals of the same species live together and have constant interactions with each other for resources, brood care, and territory defence, among other aspects. Hence, there is a lot of scope for conflict in such a situation. How the dominance behaviour or nature of the conflict changes as we move from a primitive form of eusociality to much advanced form is very interesting to study. 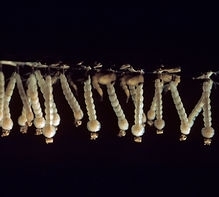 Highly advanced forms like honeybees and ants have been studied in detail with less focus on the primitive forms. Ropalidia cyathiformis belongs to the latter category and hence would serve as an excellent model system to study the role of dominance behaviour. Life history strategy refers to all the behavioral and physiological parameters that can maximize an individual’s reproductive success. Survival becomes an important factor as it influences time available for reproduction. Hence, differences in lifespan of the species may affect their important life-history traits such as host location. Life history strategy and host location have been dealt independently so far and in my study I am investigating the impact of life history strategy on the host location behavior in the non-pollinating fig wasps of Ficus racemosa. good luck sandhya, shruti, Hari, Joy!